Orthodontics at a Glance is part of the highly popular at a Glance series. It provides a concise and accessible introduction and revision aid. Following the familiar, easy-to-use at a Glance format, each topic is presented as a double-page spread with key facts accompanied by clear diagrams encapsulating essential knowledge. 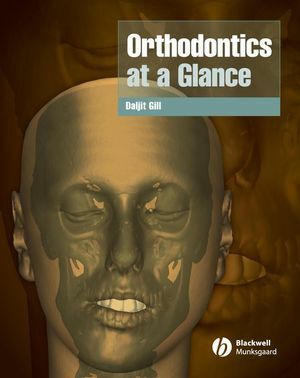 Orthodontics at a Glance is the ideal companion for all students of dentistry, junior clinicians and those working towards orthodontic specialization. In addition the text will provide valuable insight for general dental practitioners wanting to update their orthodontic knowledge, orthodontic nurses, therapists and technicians. Daljit S. Gill is Consultant/ Honorary Senior Lecturer in Orthodontics at the Eastman Dental Hospital (UCLH NHS Foundation Trust) and UCL Eastman Dental Institute. He is also Honorary Consultant at Great Ormond Street Hospital for Children NHS Trust, London. 2. An Introduction into Facial Growth and Development. 3. Growth and Development of the Neurocranium. 4. Growth and Development of the Nasomaxillary Complex. 5. Growth and Development of the Mandible. 6. Growth and Development of the Soft Tissues. 7. Development of the Dentition. 8. The Aetiology of Malocclusion I: Skeletal and Soft Tissue Factors. 9. The Aetiology of Malocclusion II: Locals Factors and Habits. 10. The Classification of Malocclusion. 11. Principles of Orthodontic Treatment Planning. 12. The Risks and Benefits of Orthodontic Treatment. 14. Extra-oral Examination: Skeletal Pattern. 15. Extra-Oral Examination: Soft Tissues. 22. Class 2, Division 1 Malocclusion. 23. Class 2, Division 2 Malocclusion. 29. Poor Prognosis First Permanent Molars. 35. The Biology of Tooth Movement. 36. Biomechanics of Tooth Movement.